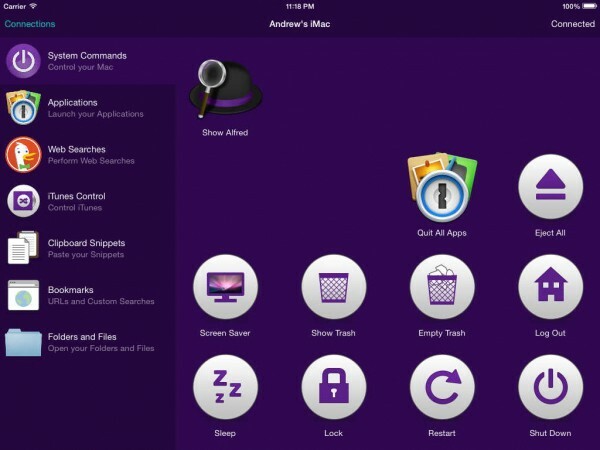 Alfred Remote ($4.99) by Running with Crayons Ltd is an app that turns your iOS device into your personal command center for Alfred 2 on Mac. 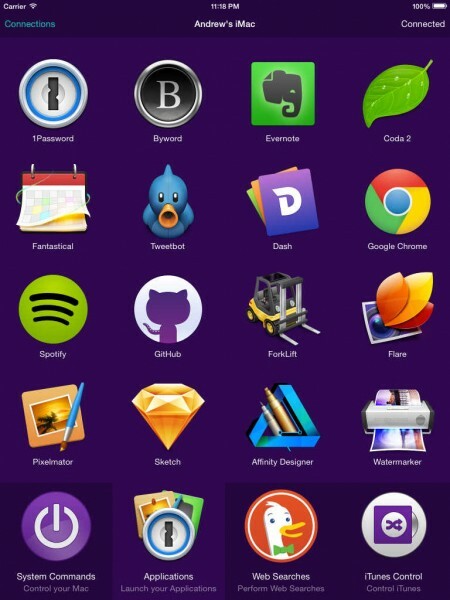 If you are a user of Alfred 2 and want to have a mobile complement to your Mac all day long, then Alfred Remote is worth a look. I’ve been a huge fan of Alfred ever since it came out several years ago, as it fully replaced the old Quicksilver for me. 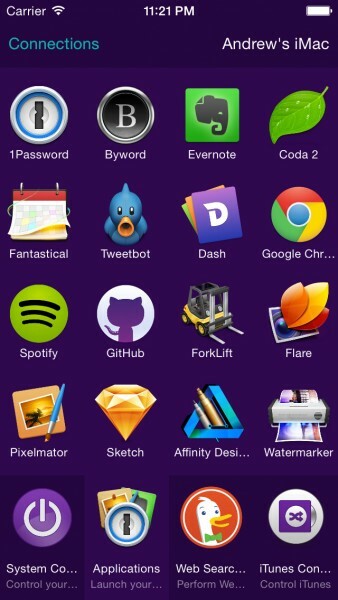 Not only does Alfred make launching apps faster and easier for me, but it had useful things like a built-in calculator, quick Internet search shortcuts, and full customization of how you want things to run, like theming. Even though Alfred 2 came out about a year or so ago, I have been running version 1.4 with the Powerpack on my MacBook until yesterday, since it was doing the things I needed without issue, and I saw little reason to upgrade to v2.0. Of course, this was all prior to Alfred Remote’s release, and I finally bit the bullet and purchased a Mega Supporter license yesterday, just to make use of Alfred Remote. Was it worth the money? The interface for Alfred Remote is simple, beautiful, and designed to make your life easier. The app makes use of large icons so you can quickly see what you are able to do with the remote, and pagination to make switching between different actions intuitive and fast. 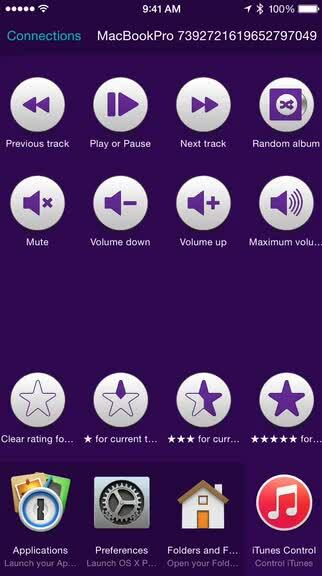 The signature purple color used throughout the app will make you feel right at home if you’re a longtime user, and the bright blue text for the corner buttons contrasts nicely. Overall, the visual aesthetic of Alfred Remote makes it a winner. Setting up Alfred Remote with Alfred 2 is simple, and explained clearly in the app when you launch it for the first time. 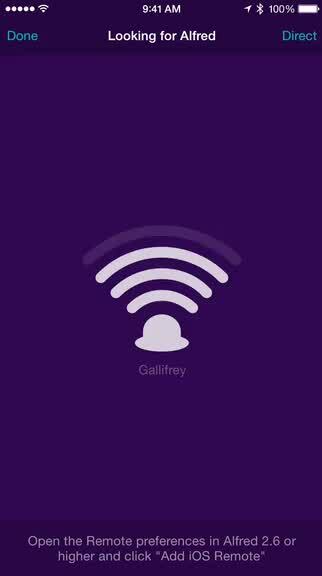 In order for Alfred Remote and Alfred 2 to see each other, both devices will need to be on the same Wi-Fi network. Then you’ll need to launch Alfred 2’s preference panel and head to the Remote section. Make sure the “Enable Alfred Remote Server” box is checked off, and then click “Add iOS Remote” in the bottom right corner. 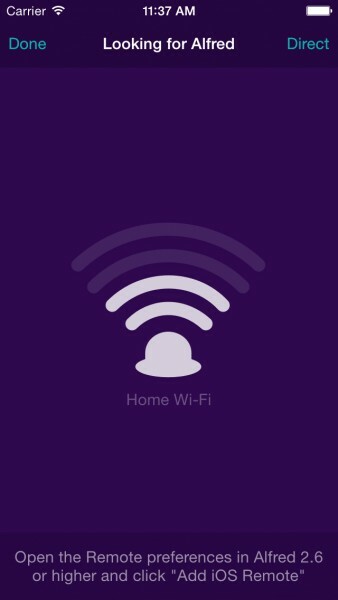 When you’re on this step, grab your iPhone or iPad with Alfred Remote and launch it — if it’s on the same Wi-Fi network as the Mac, then you will see your Mac’s name show up. Tap it ad then enter the 12-character passphrase on iOS into Alfred 2 on Mac, and then the two devices will be able to talk to each other. 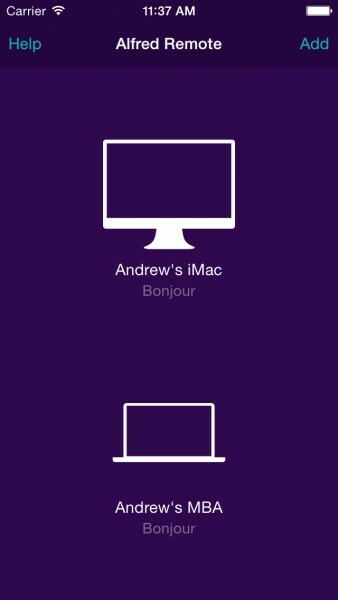 If you have multiple Macs in the house with Alfred 2, repeat the setup process for each of them. You’ll be able to choose which Mac you want to pair to at the time from the Connections screen. 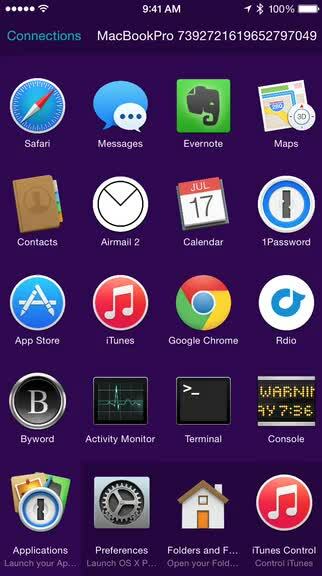 When you connect Alfred Remote to a Mac, you’ll see a screen that is filled with icons and tabs. By default, Alfred Remote will include the following pages: System Commands, Applications, Preferences, Folders and Files, Bookmarks, and iTunes Control. If you want to get more, you have to add them manually from Alfred 2’s Remote preference panel. You can add example pages, or if any of your Alfred 2 workflows have a Remote page, they can be used. If you make any changes to the order or pages, they will reflect immediately on Alfred Remote. Sections like Applications can be customized to your liking from the Mac. Just delete stuff you don’t use, then drop in applications and actions you want a shortcut for. As you swipe through the section pages in Alfred Remote, when you find an action you want to use, just tap on the icon. The action will then kick into effect on your Mac, which is handy. This is a great way to enable your screen saver or lock your Mac remotely if you are away from the keyboard, or even control what is playing in iTunes. It’s a fast way to get access to a specific System Settings panel too. While some actions will happen right away, such as turning the screen saver on or locking the Mac, other actions will require prompts, which only show up on the Mac at the moment. These include system actions like restarting or shutting down, and even quitting all open applications. It’s a bit inconvenient at the moment to have the prompt come up on the Mac screen instead of the iOS device, but the developers are working to include prompts in iOS instead in the future. Personally, I can’t wait for this, as it would be awesome to be able to shut down my Mac from bed. At the moment, my Alfred Remote setup is pretty basic as I’ve only upgraded to Alfred 2 a day ago, but I am hoping to change that soon as I acquire new workflows to test out. While Alfred Remote may not be for everyone, as most people who use Alfred may not be far from the keyboard anyway, I think it’s a fine complement if you ever need to control your Mac from afar. The only drawbacks of Alfred Remote right now is the lack of keyboard input for searching files or albums in iTunes, as well as the on-screen prompts for certain actions. However, after a bit of digging around on their Twitter page, it seems that these two issues will be addressed sometime in the future, so I’ll be eager for that update day. It would also be nice to be able to control your Mac remotely, without the need for both devices to be on the same Wi-Fi network. Hopefully this is possible in the future as well. I recommend giving Alfred Remote a try if you have Alfred 2 running on your Mac. It may not be for everyone, but it is still a handy tool to have on your side. 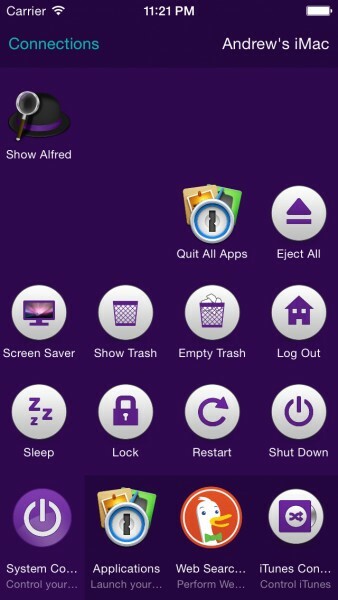 Alfred Remote can be found on the App Store as a universal download for $4.99. Alfred 2 (required for Alfred Remote) can be downloaded from their website for free, with a Powerpack license costing about $26.